Fancy a drink with a view of the Castle? Or would you prefer to watch a romantic sunset with the city at your fingertips? 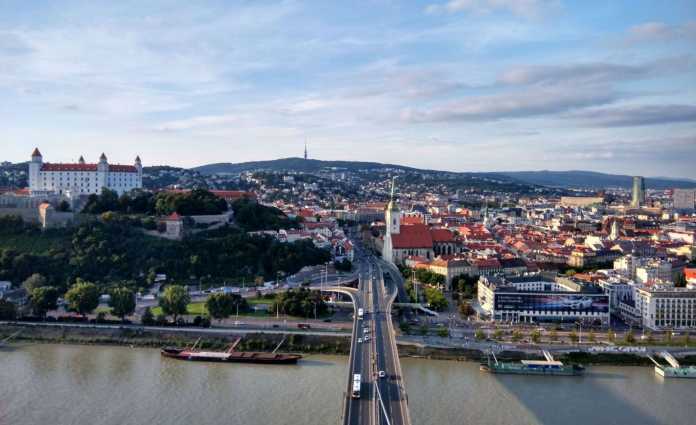 Bratislava is rich in spots from where you can enjoy its beauty, be it while having a drink, savouring delicious dinner or visiting some of its famous tourist attractions. 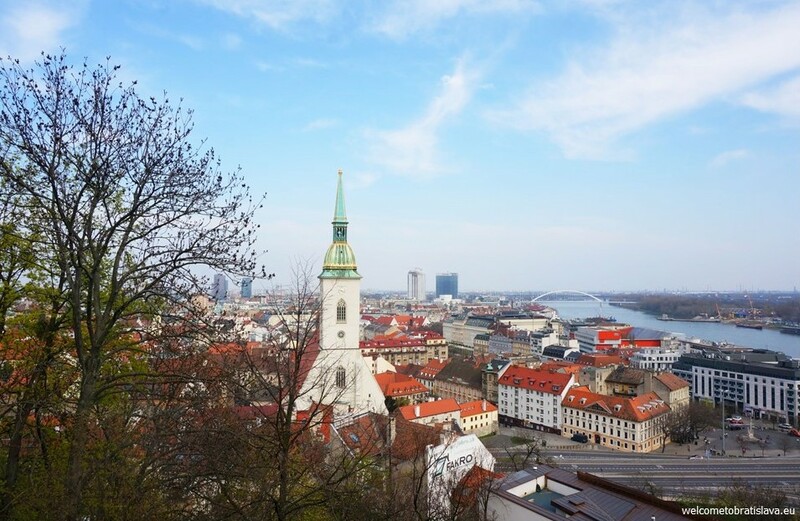 If you want to see Bratislava from all its perspectives, you have to go up to one of these viewpoints and enjoy the view of the city from the sky. 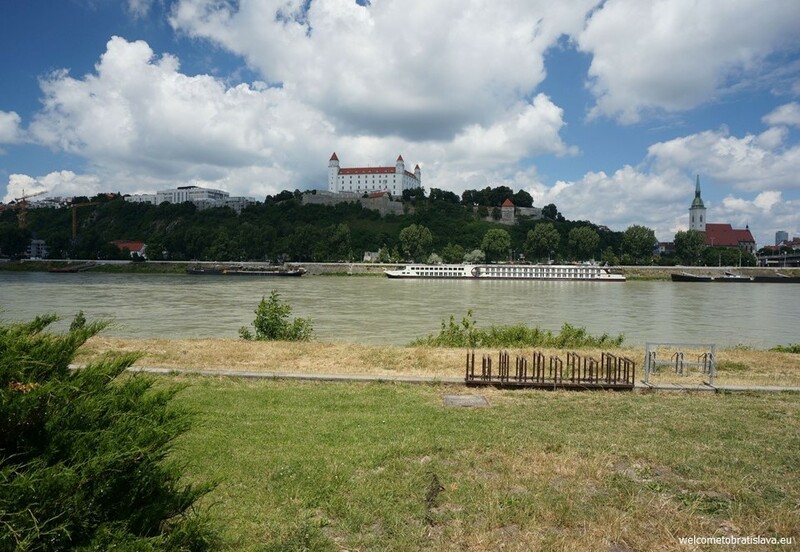 The main tourist attraction and the most significant symbol of Bratislava. 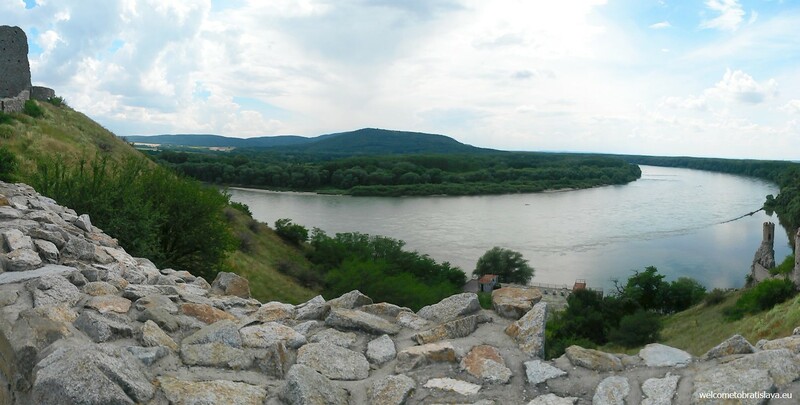 In the past controlled by Great Moravia and for almost 200 years stored the crown jewels of Hungary, nowadays hosting many expositions and offering a stunning view! 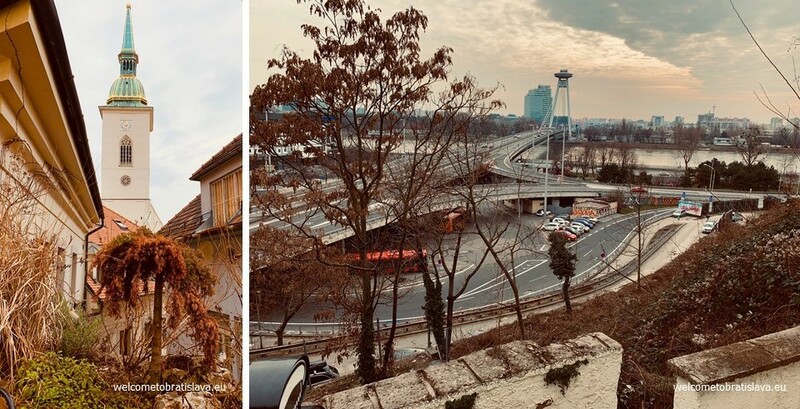 Michael’s Gate is the last standing gate in Bratislava. When walking through the Gate, look up and you will see the Micheal’s Tower. Make sure you check out the Museum of Arms on the top floor of the Tower for a great view on the city! 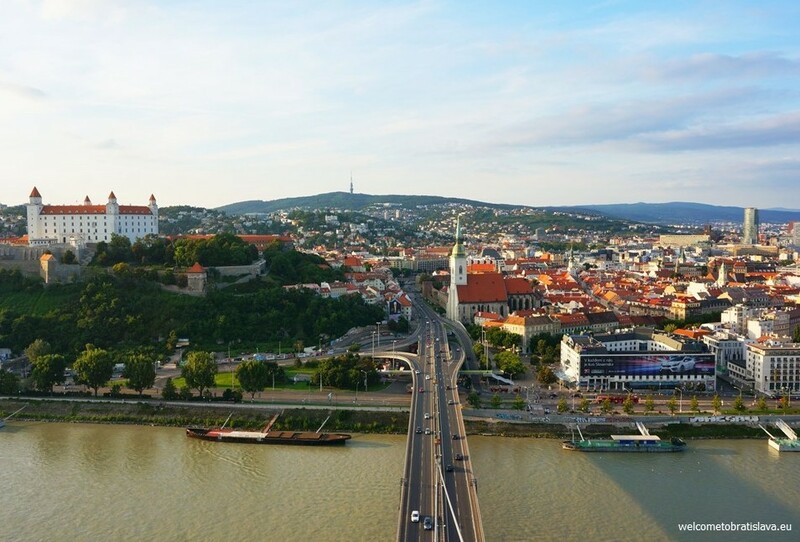 Get a panoramic view on the whole Bratislava from the open-air observation deck on top of UFO-shaped cupola over the New Bridge 95 meters above ground. 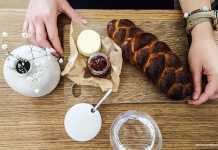 Refresh yourself in a fine dining restaurant or a bar which are up there, too. But mainly – get your camera ready! Photos taken here will surely be a great memory! The view is stunning both during day and at night. 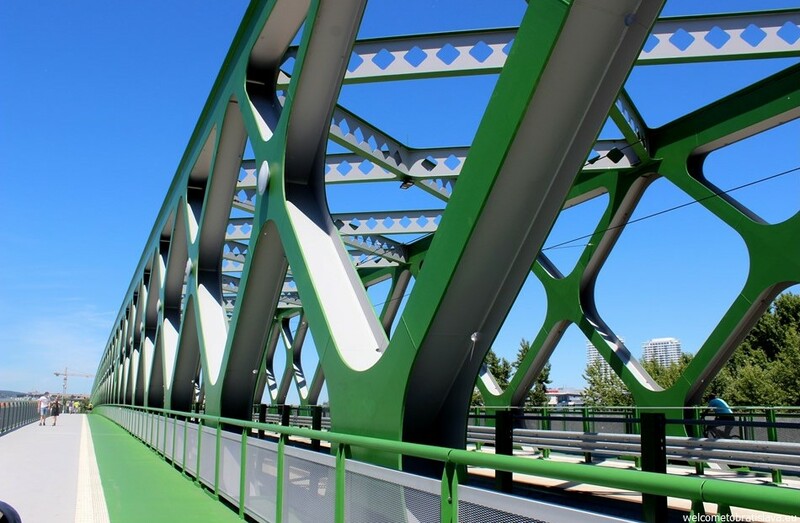 The Old Bridge is the oldest bridge in Bratislava and at the same time the newest one – it has been reconstructed after 124 years. You will love its distinctive green color. 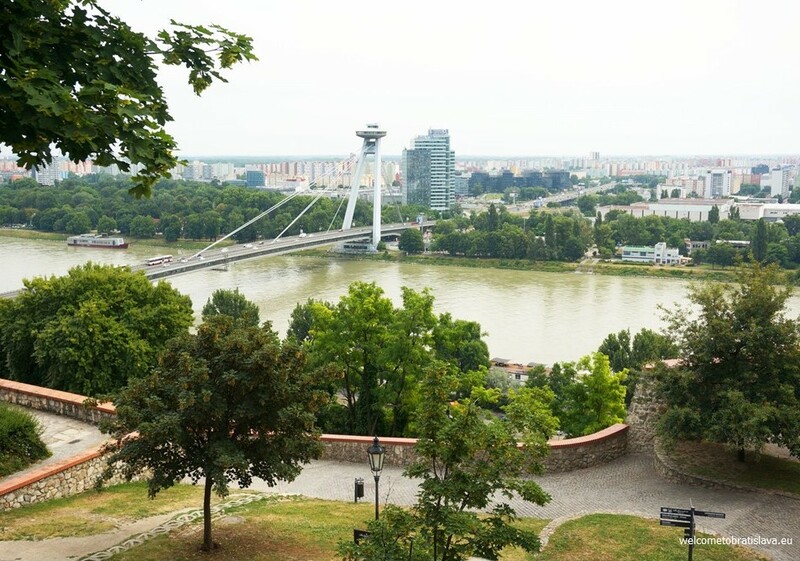 Enjoy a beautiful walk here with a perfect view on the Danube river and its embankment. 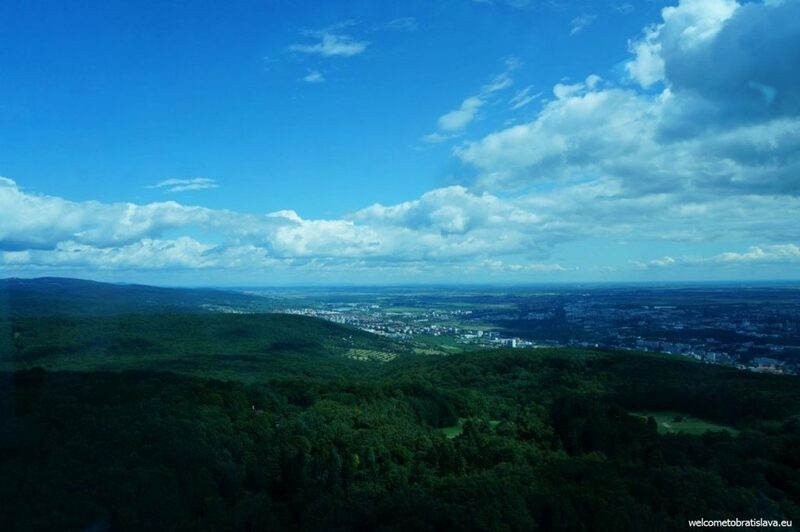 Kamzik Tower is an actual TV tower and the second highest point of Bratislava. 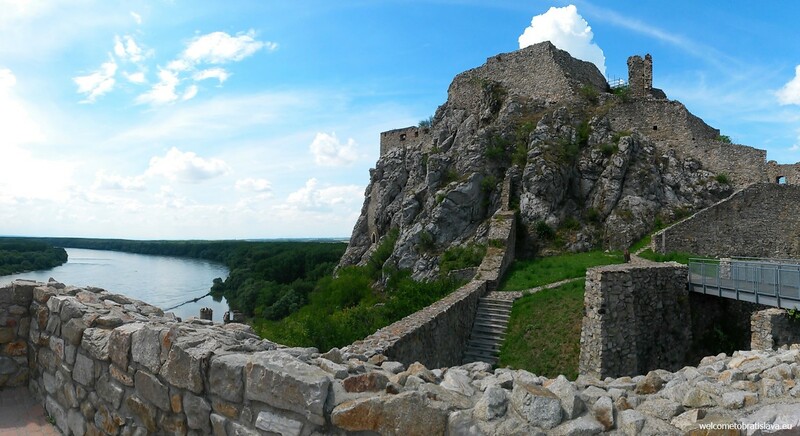 On its top, there is an observation deck (almost 200 meters above sea level) from where you have a perfect view on the whole city and you can even see the territories of boarding countries with Slovakia. You can either dine in the main restaurant (called Altitude), or have something in its bar (called Brasseria). The restaurant’s corner sections are rotating so you can have a 360-degree panoramic view! Not afraid of highs? 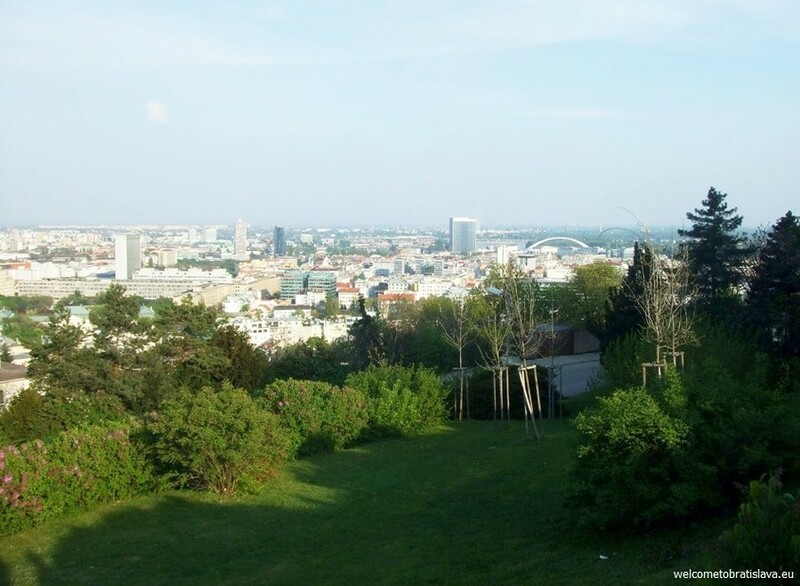 Take the cable car from Kamzik to „Zelezna studnicka“ which is another forest park and a great spot for barbeques. Slavin is a memorial monument and military cemetery of almost 7 000 Soviet soldiers who fell during the World War II while liberating the city in April 1945. 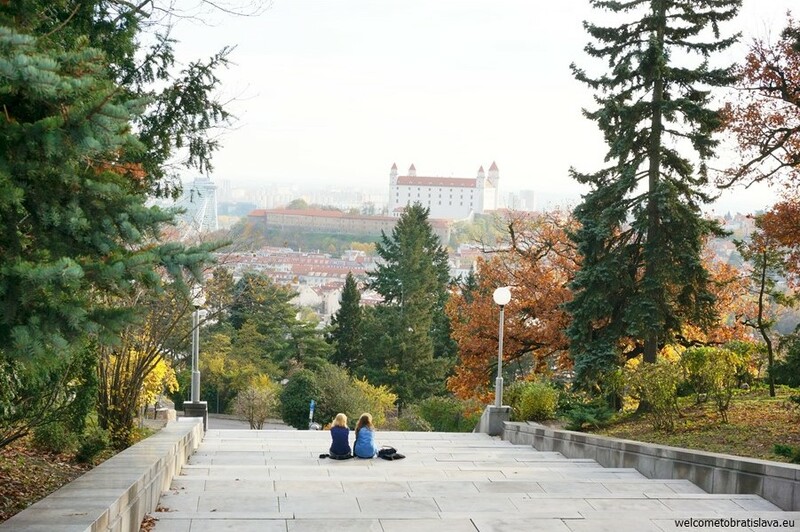 This National Cultural Monument is situated on a hill above the castle which offers a beautiful view on the whole Bratislava. Because of that as well as its quite surroundings it is often a choice for couples who come to hide here from public and spend some romantic time with their halves. 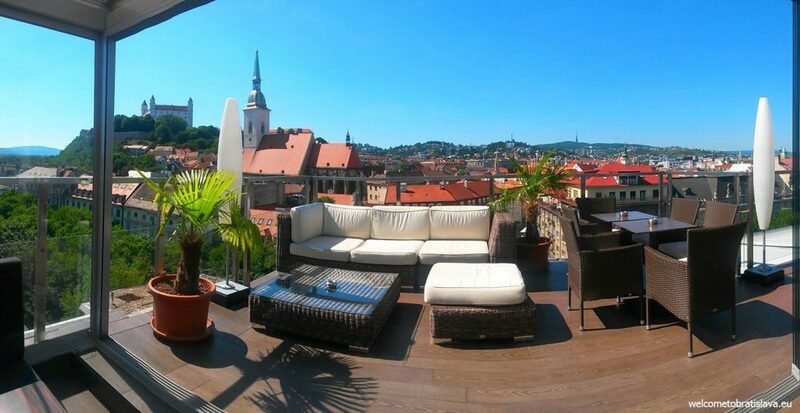 Sky bar has one of the most beautiful views on the Castle, St. Martin’s Cathedral and Old Town among the places in the city center. Located on the seventh floor, it is also called a vodka bar, offering seventy different kinds of exclusive vodkas but of course you can also choose from a wide selection of delicious cocktails. The bar serves as a restaurant, too, providing Mediterranean and Thai cuisine, so you can dine here enjoying the sun shining to your face or admiring the sun set in the evening. Situated on the 13th floor of Lindner hotel, Outlook bar offers you a full Bratislava view from a different angle. 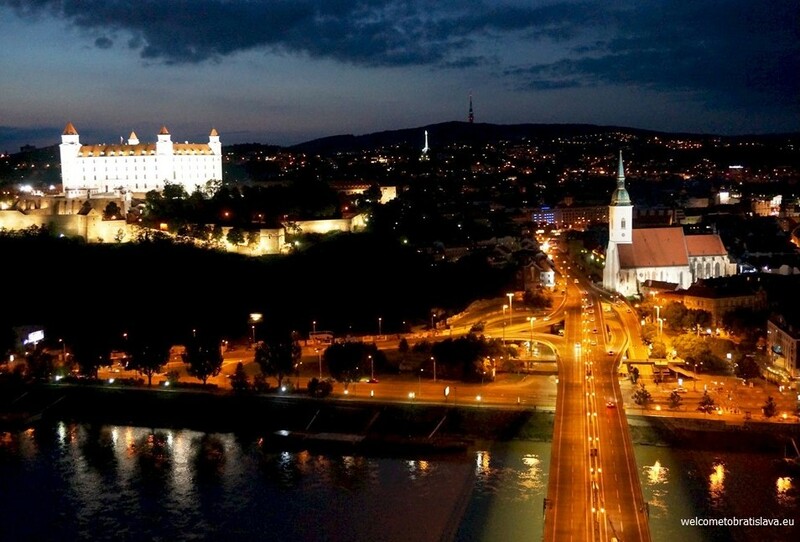 Sip a delicious cocktail or have a romantic dinner while watching a sunset over Bratislava. 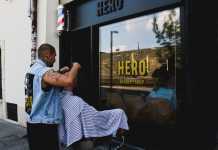 Your experience will be strengthened thanks to a glass wall. Notice an interesting ceiling, covered by a black and white map of Bratislava streets. One of the places that offers a great view without getting you up in the sky. Situated in the building of Slovak row club, Auspic offers a perfect view of the Danube river and direct shot of the Castle! This is a good option if you want one of the best views directly from your bed. Apart from accommodation services, Zeitlos is a bistro/pub located in the heart of the historical centre. While eating their signature burgers on the terrace, stare at the iconic St. Martin’s Cathedral from the first row or watch the city from a completely different perspective. Nice post. I was checking continuously this weblog and I’m inspired! Very useful info particularly the remaining part :) I deal with such information much. I used to be seeking this certain info for a very long time. Thank you and good luck.